Recreational opportunities are numerous and nearby Evergreen Cabins. This area of Pennsylvania is virtually a recreational paradise, as evidenced by the number of visitors from out-of-state. Recreation opportunities are also available year round. HIKING TRAILS ARE AVAILABLE YEAR ROUND AND THE VIEW IS BREATHTAKING. WALKTHROUGH 200-FOOT-TALL TREES IN THE ONLY ORIGINAL OLD GROWTH VIRGIN TIMBER FOREST IN THE EASTERN UNITED STATES. IT INCLUDES AN AREA KNOWN AS THE FOREST CATHEDRAL WHERE YOU CAN EXPERIENCE NATURE UNTOUCHED. A PLACE WHERE OUR CHILDREN CAN STILL EXPERIENCE NATURE AS IT WAS MEANT TO BE. In the Spring, fishing season opens in April and streams in the area are stocked with trout. The Clarion River and nearby streams have a variety of species of fish, including trout and bass. The river and its tributary streams are also very accessible, with secondary roads along large portions. In the summer, horseback riding, canoes, miniature golf, bumper boats, go-carts and a slick track are located across the road from us. There are additional stables and canoes within a few miles. Thousands head for the water in inner tubes, canoes, and rafts. There are also lots of big rocks and a picnicking area along the Clarion River where non-swimmers can simply relax in the shade, cookout, or fish. 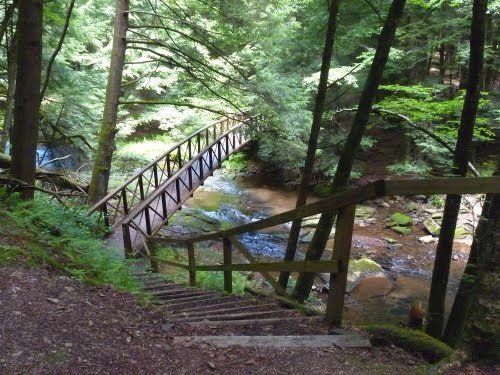 Cook Forest offers miles of easy hiking trails and scenic lookouts. There is also a golf course nearby for the golf enthusiast. For the younger kids, there are water slides, bumper boats, and go-cart rentals close by. In the fall, thousands of visitors come to enjoy the changing of the leaves in our colorful hardwood forests. Local festivals like the Autumn Leaf festival in Clarion also hold numerous activities for every age. Hunters will find that Pennsylvania offers some of the best whitetail deer hunting in the world. Pennsylvania boasts one of the finest game management programs and our area offers miles of open hunting nearby, including game lands, national forests, and designated areas within Cook Forest itself. In the winter, cross-country ski trails are nearby and there are roads designated as open to snowmobiles and ATV's. There is also a skating pond along the Clarion River where you can build a fire and roast hot dogs or marshmallows. Clear Creek State Park is less than 10 miles away. Pennsylvania's only national forest, Allegheny National Forest is located less than 1/2 hour away from us. Kinzua Dam is about 45 minutes away.